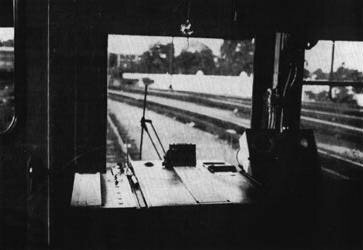 Above, the business end of Sperry car 125, showing the recording table from which the test operator controls operations. Main induction and ultrasonic records are shown in the center, with supplementary information from detection systems on the recorder at left. 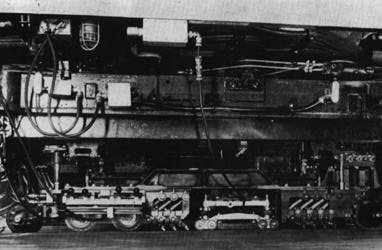 Below, a closeup view of a test truck. All devices contribute to railroad safety. In the past 20 years, Sperry cars have tested more than 295 million joints ultrasonically.